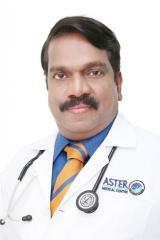 Dr. Jayakumar is a Consultant Gastroenterologist working with us since 2008. Dr. Jayakumar is a Consultant Gastroenterologist at Aster Clinic Al Muteena, with over 18 years of experience diagnosing and treating patients by administering specialized medical treatments and procedures. He is an expert in Upper and Lower GI diagnostic and therapeutic endoscopy. He possesses special experience in ultrasound scan abdomen examinations and interventions. , as well as experience in capsule endoscopy of over 200 cases in the UAE. Dr. Jayakumar has an excellent ability to develop and present educational programs and workshops and is a good organizer of CME conferences and cultural programs. He has a sound knowledge of current principles, methods and procedures.